Out of the box, SQL Server comes with a substantial and – release by release – ever-growing set of system tables, views, stored procedures and functions. There’s a good chance you’ve never directly used more than a handful of them. That’s certainly the case with me! This is the first article in a series designed to explore this world that lives just below the surface of our everyday interactions with SQL Server through the same objects we create to enable the applications we write and support. Great! At least you now know something about the instance you’re connected to. You also have the service pack (SP1) and platform (X64) and you think it might be running on Windows Server 2012 R2, at least, according to Wikipedia! As it turns out, I ran that query on the laptop I’m using to write this article, and it is not running Windows Server. It’s actually running Windows 10! Can I coax that information out of SQL Server somehow? So, now I know I’m running Windows 10 Pro. If I actually was running on Windows Server 2012 R2, I would have seen a SKU of 8. So, I know that the instance name is MSSQLSERVER (the usual default name) and that there are no other arguments. Great! That’s a simple setup. Note that the first two columns are the registry key and value name. You can get the same information from the registry using those as locators, assuming you have the right permissions on the operating system itself. Note that I can also see the service account the process is running under. OK, OK! I’ve just revealed that I only have 8 MB installed on my laptop. Amazing what you can do with just a little, though! Which tells me that I have three sessions going (true!) and one of them is running a SELECT. In fact, it’s the query used to produce this output. This option is used to control whether or not the named system extended stored procedure can be executed. This particular one is quite powerful since, if enabled, it allows a T-SQL query to execute arbitrary operating system commands in a command shell launched from with SQL Server. Many shops keep this one disabled (it is also disabled in my case, as indicated by the 0 in the fourth column, config_value). Some dispute whether disabling this option really provides any protection. See the article by Jen McCown in the references and draw your own conclusions. So, you can see at a glance who is there and what they can do at the instance level. Instname, instgroup and instuser indicate if the login is a Widows user or group, a Windows group and a Windows user respectively. 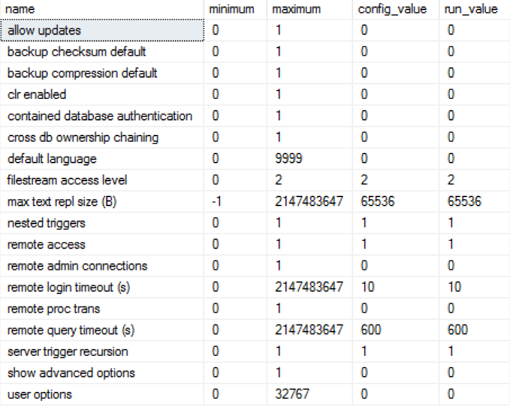 A setting of 0 indicates a SQL Server login. Using a few of the many system views and stored procedures available in SQL Server, you can get a handle on the setup of a server that is new to you. Try these out on any server to which you currently have access. The results will interest you and may even surprise you! Gerald Britton is a Senior SQL Server Solution Designer, Author, Software Developer, Teacher and a Microsoft Data Platform MVP. He has many years of experience in the IT industry in various roles. Gerald specializes in solving SQL Server query performance problems especially as they relate to Business Intelligence solutions. He is also a co-author of the eBook "Getting Started With Python" and an avid Python developer, Teacher, and Pluralsight author.